Found 8 file extension associations related to 6D Embroidery Software and 4 file formats developed specifically for use with 6D Embroidery Software. The powerful new 6D Embroidery software will inspire you to create exquisite, custom embroideries. Advanced features give you more precision, more capabilities, and more control. 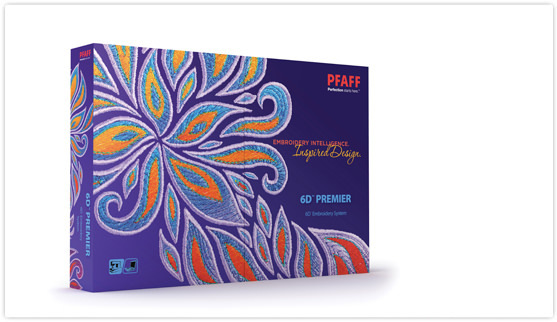 The PFAFF 6D Embroidery System will help you make all your embroideries unique! Change colors of a design to see precisely what it will look like before you stitch it out. Add an elegant monogram to give it the personal touch. With the 6D Embroidery System, you can do it all. You can even create your own perfect designs with PFAFF embroidery software. Whether you choose the automatic ExpressDesign Wizard and QuiltBlock Wizard or 6D Design Creator, which provides complete control together with a streamlined creation process, your creativity is unlimited. If you need more information please contact the developers of 6D Embroidery Software (VSM Group AB), or check out their product website.